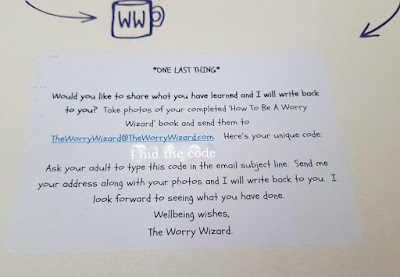 The Worry Wizard is a concept created by Counsellor and Psychotherapist Amy Smythe. 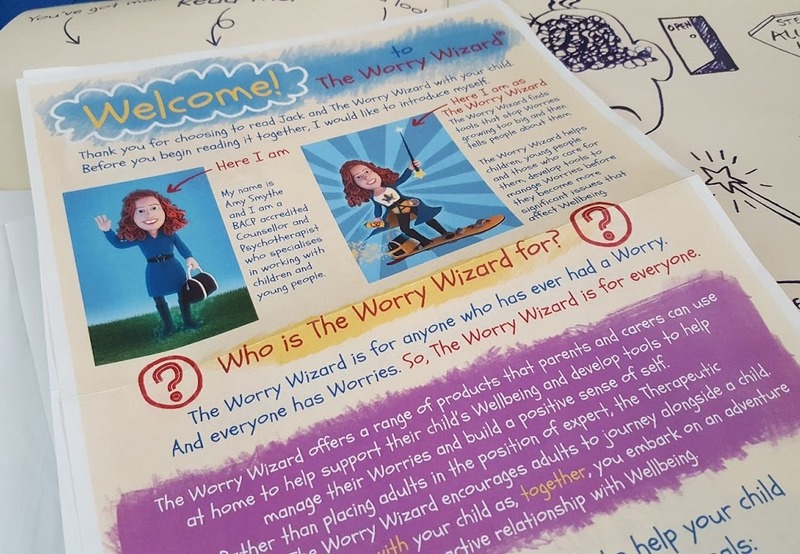 Worry Wizard products aim to help children and young people to develop tools to deal with worries before they become something more serious and affect day-to-day wellbeing. Jack And The Worry Wizard is designed especially for young people of all ages and is far more than 'a book'. This is access to support from a genuine counsellor and the book is really a launching point which you and your child build on. 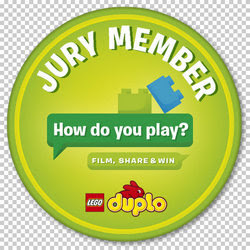 I read it together with my 7 1/2 and almost 9 year old boys. Our situation is very different to most people's. My young boys have added worries that a lot of children fortunately don't have. 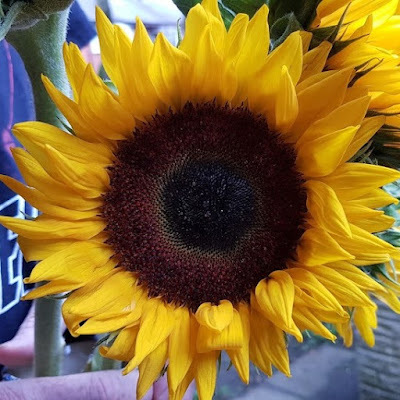 They have lost their sister and their day-to-day is not what we ever anticipated. They live in a house where unfortunately mental health concerns have been fairly normal now for 3 years. 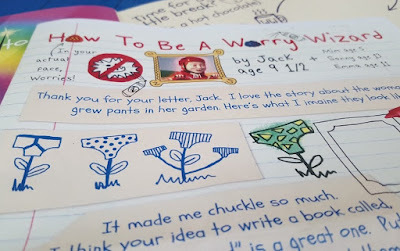 Inside the front cover is an introduction letter which explains the background to the book and story, and how to use the materials. 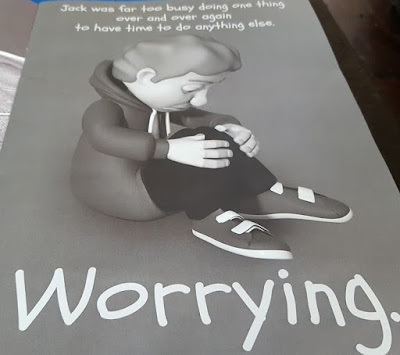 The book itself is very short and only a 5 minute read, except that it has obvious points where you can stop and discuss with your children as the main character Jack becomes overwhelmed by worries. 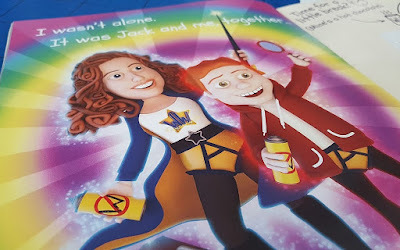 At the back of the book is another pocket with snippets from letters between Jack and Amy, his Worry Wizard. 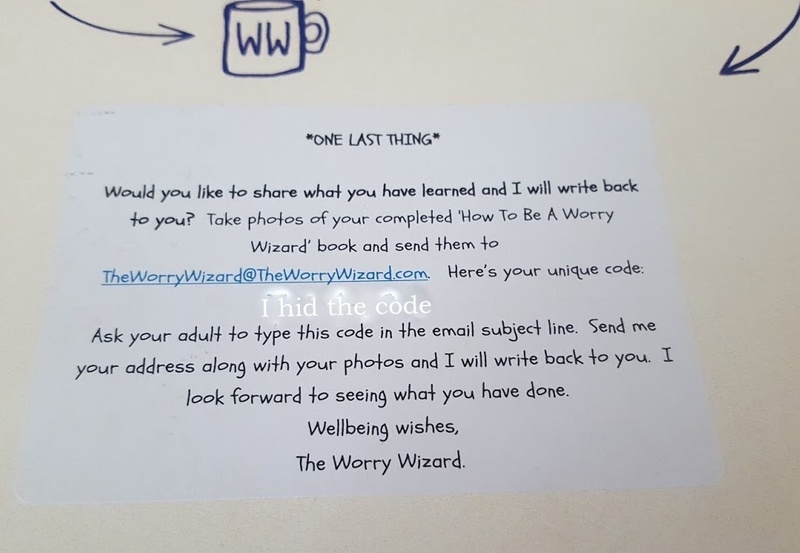 He's feeling good and writing a guide about 'How To Be A Worry Wizard'. As the letters go on, at times he needs a bit of encouragement and help to keep going and beat his worries. Your child is then encouraged to write to the Worry Wizard with what tools they have to deal with worries and what they've learned from the book. They will get a genuine reply, just as I did when I contacted her to say I was a bit lost with the book. She's lovely. 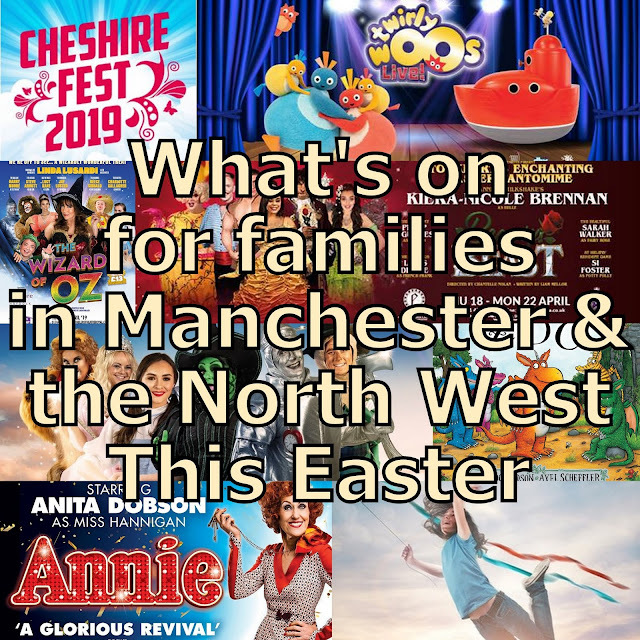 We have worked with our children on separating adult worries and children's worries, and trying to help keep them as children for a while longer, but they are incredibly close and protective and often very mature in their outlook. As we worked through the book it was obvious my 8 year old had something he was worried about, and he felt able to share. He told us he was worried he might not get his choice of career. He's almost 9, but passing exams is very much a worry of his older siblings. He has brothers and a sister aged 17, 18, 19 and 23 who have almost all taken important exams this year. It hadn't occurred to me at all that he might listen to their discussions and take on their worries. 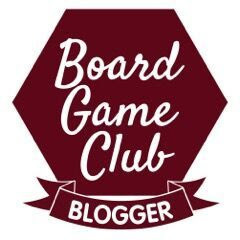 I'm delighted we read this book, because I was able to explain to my son that the games designer role he's decided he wants is entirely within his grasp. He is a long way off having to worry about exams and the same as any child his age, just do the best you can at school. I also gave him a look at HTML and explained he has a fair grasp of Python and this is a real world computer language. He was delighted and that worry at least eased. 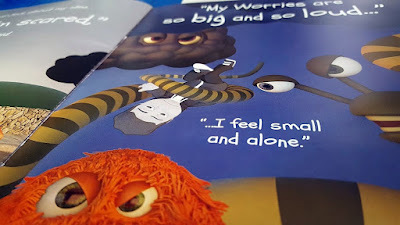 I was sceptical, and at first my sons looked at the book and thought it seemed a bit 'babyish', but the story is very much just an open plan background that can apply to almost anyone and any child can associate with it, so they changed their minds very quickly. 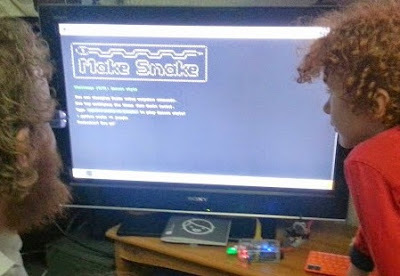 I can only be impressed as we did find out one of my son's worries and take steps to solve it. My younger son also shared small niggling worries and a nightmare he's had, and I think any good Worry Wizard has to be able to listen. Talking and being heard is clearly the most efficient tool in the toolbox. The Jack And The Worry Wizard Book isn't quite out yet, but there is loads more information and a range of products on The Worry Wizard website, and you can keep up to date by following them on Facebook or Twitter. 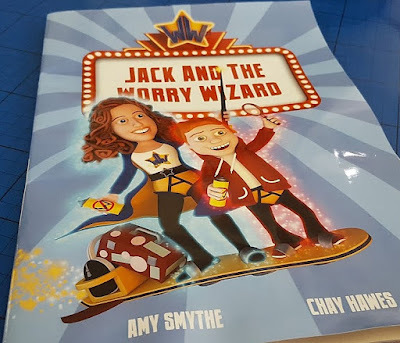 We were sent our book for review.